Share the post "Corporate Consumerism"
I wasn’t expecting the humidity to be as great as it was today–especially this afternoon. Seems we become all the more comfortable with the cooler/drier temperatures, and then wham, it’s back. While driving back from Minneapolis yesterday, I couldn’t help but notice how tall the corn was all those many miles. All the moisture and heat we’ve been getting, has certainly paid off for our farmers. The world seems all in a stir about these trade wars that’ve started, but perhaps there’ll be a silver lining in it for us all. I hoping we’ll all begin to realize we don’t have to have all that cheaply built consumer oriented garbage that rolling out of China. There’s no question in my mind that nearly all their consumer goods are markedly inferior. It’s never about quality, but rather all about money and profits. It came as no surprise today when reading about their vaccine scandal. It doesn’t seem that long ago they were having a scandal over tainted baby formula. My greatest fear is all the plastics that are produced in China that are “supposed” to be safe. It wouldn’t surprise me if much of it’s hazardous to our health. Speaking about health, the idea crossed my mind regarding how much un-necessary garbage we produce on a per capita basis. I began thinking about ways to make our footprints on our natural world lighter. First of all, we could start going back to the way it was in the old days when you’d have your own re-useable cloth bags and wooden crates to carry whatever you purchase at a grocery store or outdoor market. Most Europeans don’t wrap their bread, so why do we? Stores like Fareway still weigh and wrap in paper everything that’s purchased at the meat counter. More stores should be selling all the basics like flour, beans, grains, coffee, and just about everything else that’s dry, in self-service bins like they do in Hy-Vee, but also make sure that those plastic bags are earth-friendly and bio-degradable. What I really bristle over is seeing all the styrofoam packaging being used in grocery stores. People have no idea how bad that is for our environment. I’d like to challenge all of you to open your minds and think of all the alternative ways you can lighten your footprints on our earth. There’s one particular couple living out West who’re almost at 100%. They compost all their organic refuse, including all their waste paper. They have chickens that eat their table scraps, and anything left un-eaten goes in their compost drum. The don’t buy canned goods, but instead get what they need from bins like Hy-Vee has. They also have their own cloth grocery bags, and if they do happen to be given plastic, it’s saved until the time arrives to take it back to the recycle center. I couldn’t congratulate them more on their abilities to limit waste. Now if all Americans would be that earth-friendly, we’d all be living healthier lives. Just remember, nearly all our creature habits were quietly and cunningly injected into our culture by corporate consumerism. Please don’t forget to take the challenge and see how earth-friendly you can become. Whether we want to admit it or not, we are not owners of this earth, but rather its stewards for future generations. 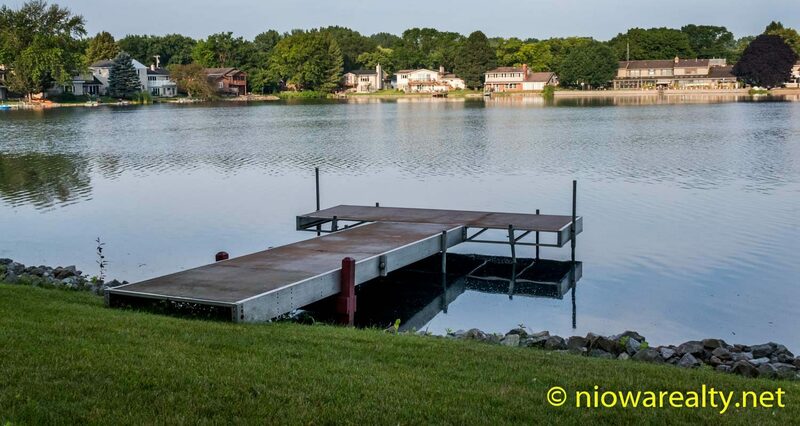 Tonight’s photo is of the dock belonging to 40 Lakeview Drive. Don’t you just want to go out and have a seat and cool your feet in Lake Cona Toma’s water? Tonight’s one-liner is: A wall with cracks will soon collapse.